New American Funding: In-depth Review | SuperMoney! Founded in 2003, New American Funding is an independent mortgage lender that serves all U.S. states except Hawaii and New York. Its mission is to provide homeowners and future homeowners with a variety of home financing options at competitive rates. If you’re looking for a home financing solution, here’s what you need to know about New American Funding. New American Funding offers loans for home purchases, mortgage refinancing, and reverse mortgages. Loan amounts range from $1,000 to $15,000,000 and eligible properties can include single-family residences, condos, townhouses, multi-units, and more. Overall, New American Funding covers all the bases when it comes to the loan options it offers. 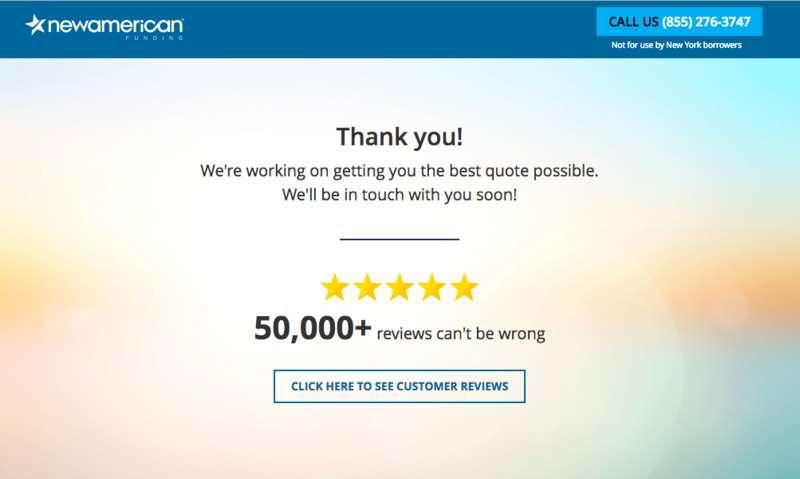 Further, loan consultants are standing by to help customers find the best mortgage option for their situation. Refinance your home for more than it’s worth and take the excess out in cash. The Federal Housing Administration (FHA) backs FHA loans, which result in more lenient eligibility criteria. A 30-year loan with a fixed interest rate resulting in even, predictable monthly payments. A 15-year loan with a fixed interest rate resulting in even, predictable monthly payments. Traditional loans with fewer requirements than government-backed loans and down payments as low as 3%. Veterans Affairs (VA) loans are backed by the Veterans Affairs department of the U.S. government and offer 100% financing. Adjustable-rate mortgages (ARMs) have an interest rate that adjusts according to the loan terms and the market. Jumbo loans exceed the loan amount limits set by Freddie Mac and Fannie Mae for more expensive homes. Home improvement loans are used for renovating your home or purchasing a fixer-upper. Reverse mortgage loans are for people 62 and older so they can cash out on their home’s equity. An interest-only loan allows you to only make payments on the interest for a set period. The Home Affordable Refinance Program (HARP) helps homeowners who have experienced a drop in their home’s value by refinancing their loan with better terms. USDA loans are a 0% down payment mortgage backed by the United States Department of Agriculture (USDA) which can be used for eligible rural homes. These are customizable loans with term options ranging from eight to 30 years. How about the cost of borrowing? New American Funding aims to offer competitive interest rates. The state of the economy. To find out which rates you can get, you will have to apply and speak with a company representative over the phone. 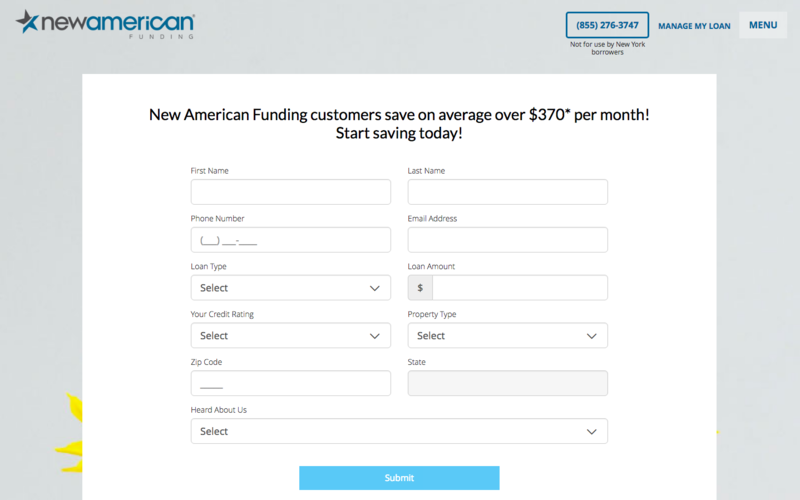 The New American Funding website gives you the option to “Apply Now.” It’s not a full online application with an instant quote, however, as some other mortgage lenders offer. It’s just a form you submit that tells the company the basics of what you need. After submitting the form, you’ll receive a quote via email or phone call. It’s convenient to be able to begin the mortgage process online by filling out a quick form. However, New American Funding doesn’t offer a true online application process (like Quicken Loans, for example). Refinance. Get a new loan with terms and costs that better suit your needs. Reinstatement. Pay a lump sum to catch up on your mortgage. Repayment. Pay what you owe through installment payments. Forbearance. Make reduced payments or no payments during a period of financial hardship. Modification. Modify the mortgage to better fit your budget. The company asks customers to call in to discuss the available options and also recommends downloading its Homeowner Checklist to see the documents that you’ll need to provide. If worst comes to worst, it also provides options for leaving your home without going into foreclosure. These include a short sale and a mortgage release. Additionally, in some situations, the company will help you to relocate. Overall, New American Funding is flexible when it comes to managing financial hardships. It’s willing to work with borrowers and offers support. Next up is the loan management. How is the experience once you’re a customer? New American Funding offers in-house servicing for the loans it originates. Shortly after taking out a loan, you’ll receive a welcome letter which explains the amount of your first bill and how you can pay it. Monthly automatic payments are withdrawn from your bank account. One-time payments on the dates you specify. In addition to making payments and viewing the details of your loan, you can get information on property taxes, forms, mortgage insurance, property insurance, escrow accounts, and more. The company will also mail you notices on a regular basis including your monthly billing statement and annual statements. Overall, its servicing is one of its strong points in an industry where many originators hand off the loans to a third-party servicer that the customer may or may not know. Is New American Funding right for you? If you’re looking for a home loan—whether to purchase a new home, refinance your existing one, or cash out your home’s equity—New American Funding is an option to consider. The company offers a thorough line-up of loan products, a good 15-year track record, flexible mortgage assistance options, online loan management, and in-house servicing. However, the online application has room for improvement and it would be nice to have the option of an instant quote. Nevertheless, the company should be on your shortlist of mortgage lenders to send an application as long as they serve your state (sorry residents of New York and Hawaii). However, remember never to take the first quote you get. Compare quotes from at least three lenders and pick the one that provides the best overall value. Compare industry-leading mortgage lenders side-by-side now.